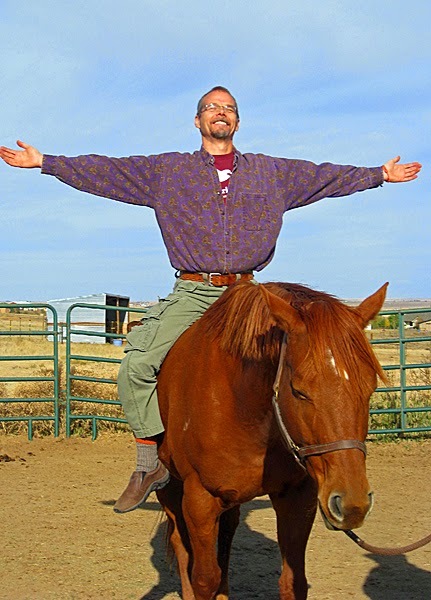 Recently I facilitated a powerful equine-assisted Soul Session which highlighted that some horses are born to do this wonderful work! 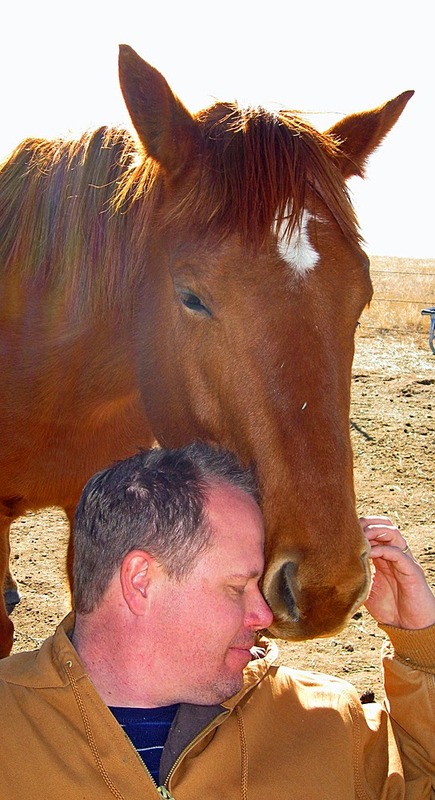 Many horses love to engage in various aspects of this work. And I am blessed to partner with one special horse who LOVES to do Core Wound work: Frolic. 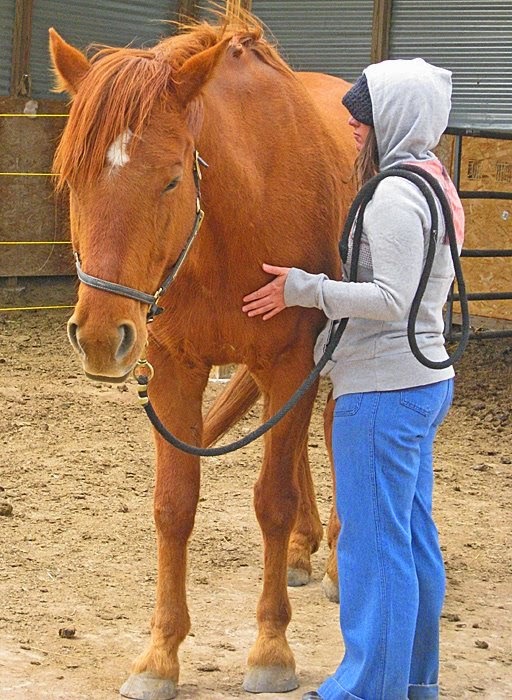 Frolic is an 11 year old, redheaded QH/TB mare who is a joy to be around. In fact, simply being with Frolic IS healing because she shares her ESSENCE, which is divine, angelic, unconditional Love. She literally wraps a client with the TRUTH of PURE LOVE, so they can recognize that they are WORTHY OF LOVE. She vibrates it for them until they can claim it for themselves and vibrate it from their own center. She is the Perfect Partner for Core Wound work, because in this aspect of the work we do here, we're searching to liberate that Inner Child who left behind aspects of her own Essence, when certain needs were not met early on. All of us have these aspects of ourselves that we turned away from or left behind due to painful events or circumstances in our youth, often with our parents or loved ones. When this happens we adopt and live out certain falsehoods or illusions that then become part of our personalities. And in Core Wound work, we enter the energy field of the body on an exploratory mission to discover what Aspect of Our True Selves have gone missing. 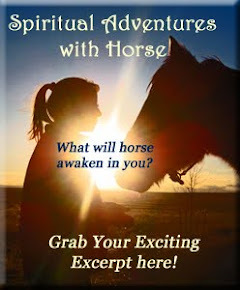 The body never lies and the horses have a wonderful ability to shine a spotlight on where we are holding these old energies of hurt, lack, and falsehood. It is through the Doorways of the Body that we can both access the Core Wounds and reclaim our Original Essence. I LOVE this aspect of the work because it is such an honor to watch someone remember Who They Really Are! It's a bonus that in this method, we really get to leave behind the story and work with the energies and the sensations found in the body-mind. And through the use of Imagination, we can call back in every and all energies which we left behind, until we are FLOWING our ESSENCE. Then we get to put our Essence into Action with the horses. It's beautiful to be able to do this work IN THE HERD. Because each herd member knows best which parts of the process they wish to assist with. In our recent session, the client was drawn to our Gorgeous Goddess, Charm, during the initial body scan. 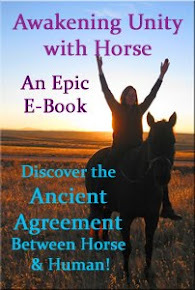 And it was clear that Charm was calling directly to her- Charm stood and stared an invitation right at the client, while the other horses had their backs to the woman. I love how the horses make their roles perfectly clear! This time around Charm chose to be the SPOTLIGHT to highlight what wanted to shift on this day, and as the client stood gently making contact with her, Charm opened the doorway to her body, so the client could FEEL into the pathway that was ready to be transformed today. As soon as that was complete, Charm wandered off to snack, showing us this aspect of her work was done! Once awareness of the wound was activated, we shifted to the next paddock, where mother-daughter healing pair Frolic and Seren stood ready to offer their assistance. Frolic made her intentions clear to be the primary "healer" on this day, as she strode right over to the client and wrapped her in a hug, while Seren stood holding the energetic space off in the corner. Charm continued to help with holding the space over the fence, all 3 of the horses dropped into the zone. While supported energetically with Unconditional Love by Frolic, through a guided process, the client soon began a dialogue with her 6 yo Inner Child, who easily revealed her Core Wound. She was angry that all of the adults had been lying to her. But despite these lies, she still remembered her Truth. She was PERFECT just the way she was. Indeed! Just as we all are! What a moment to behold in another, that moment when we remember and reclaim that WE ARE DIVINE PERFECTION. What joy to witness that sassy inner 6 year old, with her arms on her hips, stomping her feet, sashaying around proclaiming her TRUTH! She IS perfect!!! Of course! ~ Invited her to FEEL what it feels like in the body to KNOW that you are PERFECT. And in those moments, the client reclaimed the Energetic Essence of Who Really IS. She could now feel the ENERGY of her ESSENCE in her BODY, creating new pathways of felt-belief in the body & brain. It was beautiful to note that BOTH Charm and Seren came over and peed right by the client at exactly the same time- helping to release all of that PISSED OFF energy the client had identified. I love those external confirmations of internal shifts! Once her Perfect Essence was fully FELT and CLAIMED, the client got to experiment with putting her ESSENCE INTO ACTION through moving with Frolic. What could she learn by moving in the world carrying her new Essence energies? She discovered that she was never alone. That she was safe and protected. That she didn't need to focus on the past. That she could move forward. That she had a voice and could use it to proclaim her truth. That she could be seen and loved for who she is. That she was ready for the next step of attracting a loving man and creating a family. And above all, that the TRUTH was that she is WORTHY OF LOVE because she is PERFECT just the way she is. From there, ALL things become possible. When you claim LOVE from the inside, you radiate LOVE into all corners of your life. And from there, you attract beautiful loving gifts into your life. You no longer feel compelled to act out the opposite scenarios, either! It was a Blessing to behold the energetic transformation, to celebrate the tearful Soul Shifts which can happen in moments, after carrying wounds for a lifetime. And all of this, through the HeartLight of one LOVING horse and her herdmates, who wanted to serve by sharing their own ESSENCE to remind us all, that WE ARE LOVE. THANK YOU Frolic and the herd for reminding us all that we are PERFECT. And when we claim that inner Perfection, our Light shines through all of the darkness of the world, lighting the way for ourselves and for each other. Here's to each and all of you being your PERFECT selves as you help to remind others of their PERFECTION through the loving hearts of your horses! What roles were your horses born to serve? What aspects of Truth do they love to shine a light on? This is so powerful. I connected the dots of what my horses love to do, the healing they give so freely. Such a spiritual, beautiful gift. Thank you.